It probably won’t surprise parents that the amount of TV their children watch can impact the ability to maintain a healthy weight. 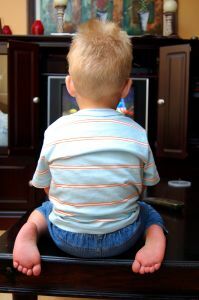 After all, watching TV is a sedentary activity, so the more TV a kid watches, the less exercise he or she gets. However, parents must also be aware that the type of TV their children watch can also have an enormous effect. In February, the UCLA School of Public Health issued a press release in February titled “Childhood Obesity: It’s not the amount of TV, it’s the number of junk food commercials.” Researchers Frederick J. Zimmerman and Janice F. Bell found that children who watch commercial TV programming with junk food commercials are more likely to be overweight than children who watch other types of TV. Everyone has experienced the siren call of the refrigerator after a commercial for a popular snack chip. The viewer sees the ad, feels a pang of hunger, and checks the pantry. Children have less impulse control than adults, and less awareness of the consequences of their actions. And children are bombarded with junk food commercials. For every half-hour television program, there are about eight minutes of commercials. Adult programs come with ads for cars and life insurance and all sorts of things that won’t make anyone gain weight, but commercials during children’s programs advertise toys and food, and that’s about it. This wouldn’t matter so much if the food ads touted the benefits of leafy green vegetables and smaller portion sizes. But no, the food commercials advertise high sugar, high fat, high salt, high calorie foods with little to no nutritional value. Junk. The ads are loud, bright, and entertaining, and they feature attractive people singing catchy little songs that kids hear over and over again in their heads. At the grocery store, many kids sing jingles or re-enact commercials when they see a heavily promoted product. That’s a good sign that the children are being brainwashed by junk food companies, and it’s the parents’ job to put a stop to it. The American Academy of Pediatrics recommends no TV viewing whatsoever for children under the age of 2. For older children, they recommend no more than 1-2 hours of TV… but specifically of educational, nonviolent TV. To that, I’ll add my own personal recommendation that children avoid commercial TV altogether. If parents find that to be impossible, then I recommend that at a minimum, they develop a family habit of muting the TV during commercials. Parents on a budget can often get DVDs for free at their local library, or purchase used DVDs at yard sales and video stores. Even if the children watch the same programs on DVD that they would have been watching on TV, they won’t be tempted by the commercials. Children may complain about the change in their routine, but parents should stand firm as they remember the long-term goal of helping their child to reach and maintain a healthy weight. This is one change that every parent can make, and that will show positive, measurable results.